Our Brother from California jumps 6 places to #4 on the WQS. He needed this one as he sits at 29th on the WCT. SURF NEWS NETWORK UPDATE: PRAIA DE GUINCHO, Cascais – Portugal (Sunday, October 4, 2015) – Kolohe Andino (USA), 21, has won the Allianz Billabong Pro Cascais over Caio Ibelli (BRA), 21, in four-to-five foot surf at the backup venue of Praia do Guincho. Andino came firing right out of the gates in the final with a solid display of power surfing on his backhand for a 7.67 and the heat lead in the first instants of the 35-minute bout. A quick exchange on successive righthanders gave both surfers limited opportunities, but Andino with an average score increased his lead over the Brazilian. Ibelli launched his campaign 15 minutes in, with a similar lefthander to Andino’s opening ride to collect a 7.10 and get right back in the mix for first place. Both surfers continued to surf the clean lefthanders back-to-back, without changing the situation as they were only able to post medium scores. On the five-minute mark, Andino found a bigger, cleaner set wave and performed two beautiful turns including a huge vertical blast against the closing section for an impressive 8.90 and eventually the win. Ranked No.4 on the Qualification Series before this event, Andino takes another firm step towards requalification for the 2016 Samsung Galaxy Championship Tour with excellent results all-year culminating with his win today. A former World Junior Champion, Ibelli strikes again this season with the runner-up result today in Cascais, and climbs up further on the QS ranks to eye a maiden qualification for the Elite Top34 in 2016. With a ton of confidence from this result, the young Brazilian will head to France to take part in next week’s Quiksilver Pro France before going home to attack the following QS10,000 of Sao Paulo. In the opening semifinal, talented Californian Patrick Gudauskas (USA), 29, battled hard with Andino and posted an excellent 9.07 for three backside hacks and a temporary lead. An exciting surfer, having demonstrated his aerial prowess earlier this week with a rodeo flip, Gudauskas looked on point but couldn’t unfortunately match Andino’s flair on the air sections and placed equal third. Coming in as No.63 on the QS rankings before Cascais, Gudauskas builds momentum and will look to bring his A-game again in the following major events of Brazil and Hawaii. In a slow second semifinal, current World No.12 Wigolly Dantas (BRA), 25, the last remaining goofyfooter in the event, couldn’t find his rhythm and kept surfing the lefthanders while his opponent Ibelli took on the air section on the rights. Eventually, Dantas’ polished forehand carves and closeout sections bashes did not suffice and the young Brazilian placed equal third. 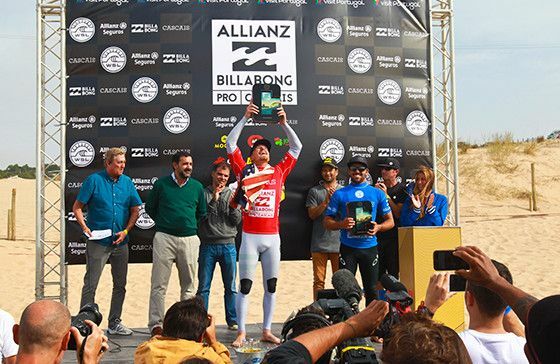 Following the completion of the Allianz Billabong Pro Cascais today, Andino takes a firm grip on the Portuguese Waves Series – Cascais Trophy’s rankings before the final showdown at the Moche Rip Curl Pro Portugal. Miguel Pupo (BRA), Wiggolly Dantas and Sebastian Zietz (HAW) will have an opportunity to overtake Andino with a big result in Peniche. The WSL Men’s QS10,000 Allianz Billabong Pro Cascais is scheduled from September 28 – October 4, 2015 in Cascais, Portugal. For all results, photos, video highlights, press releases and LIVE webcast, log on to worldsurfleague.com. The Allianz Billabong Pro Cascais is supported by the Câmara Municipal de Cascais (Cascais City Council), Billabong, Allianz, Turismo de Portugal (Portuguese Waves Series), EDP, Moche, Jogos Santa, Casa, CTT (Portuguese Post Office), Brisa, Hertz, Buondi and Hotel Viva Marinha among others.